Always helpful, Jasper gave the baby chicks lots of attention. Of course after above average March temperatures, April has been well below average. Thus the chicks arrived on the coldest day (24 degrees F) since late January. They are all fine although issues with the brooder light caused about an hour of worries trying to get the temperature correct. You can tell when baby chicks are unhappy as they make a lot of noise. Happy chicks are silent or talk to one another in very soft cheeps. All the noise made them even more attractive to Jasper. 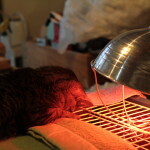 When baby chicks go into the brooder I give them water that is quite warm, about 98-100 degrees F as they will want to drink a lot and it’s important that the water doesn’t chill them. After a few hours ambient water temperature water is fine. They do a lot of sleeping the first day, but it is amazing how quickly they catch on to eating and drinking. I start feeding them by sprinkling food on paper towels and by the end of the day have progressed to an open dish. Spring is in full swing and I’ve been feverishly planting seeds before it turns hot and dry. 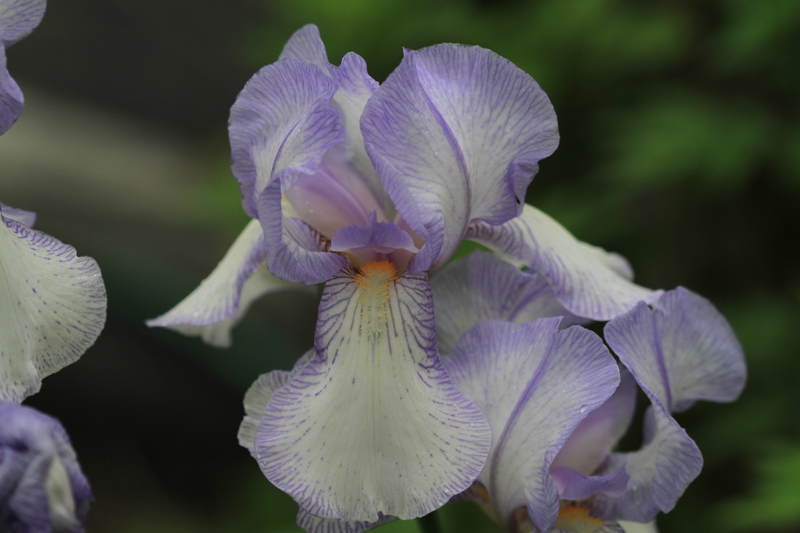 Since it was a cold, wet Spring the plants are off “normal” schedules and bloom times are compressed. All the daffodils bloomed at the same time vs over a month as they usually do. The lilacs were only open during a torrential rainy period so their odor never perfumed the air. The iris have just opened and the peonies are poised to open any day, they just need a bit more moisture. Don’t think we’ll get it soon, and it has been nearly 90 degrees for a few days so all the plants are looking for a nice drink of water. This is the new weather pattern – all or nothing, without moderation. We get no rain or 5 inches of rain and it is 15 degrees below “normal” or 15 degrees above “normal”. Both extremes being tough for living things to handle. My two surviving strawberry plants are blooming. The only way to keep them alive it to completely enclose them with hardware cloth. 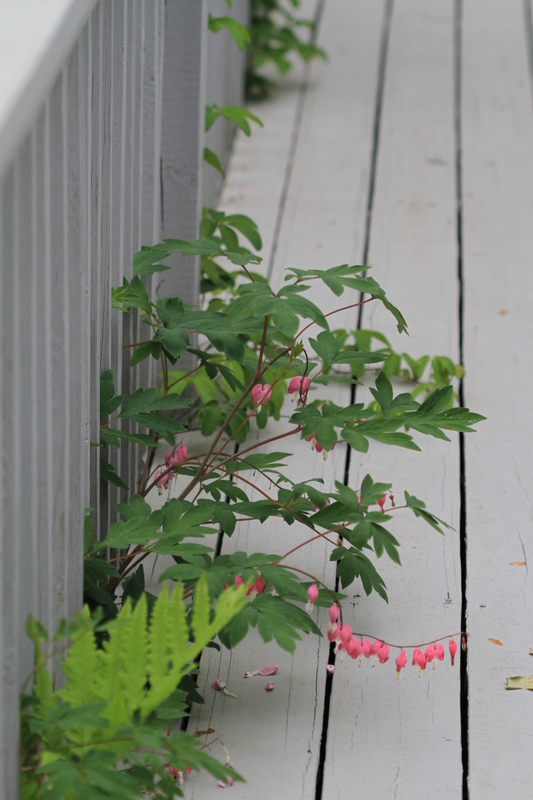 Otherwise the chipmunks destroy both the berries and the plants themselves. I had not realized how much damage these cute little rascals cause until I caught them climbing the (deer prevention) cages around my roses to reach through and eat fully bloomed roses! There is a pair roaming around on the back porch so it looks like a population increase is in the making. 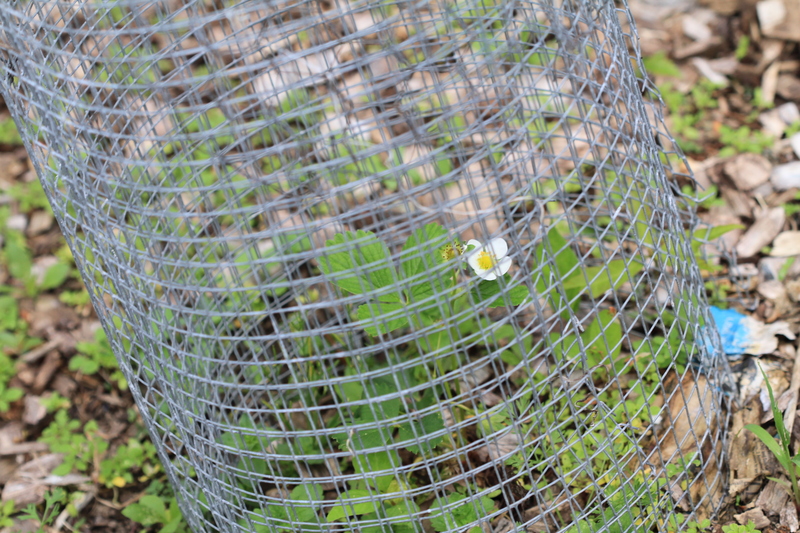 There is a baby bunny running around in the chicken area, but much fewer rabbits overall then last year. Surprising, since last year was the year the coyotes took out two of my adult goats and there was also a bumper crop of bunnies! You would have thought the coyotes would have been eating bunnies versus a 100+ pound goat. Coyote choices are fewer this year (fingers crossed!) since the goats and sheep are now locked into overnight corrals. More work for me, but hopefully creating less domestic livestock options for coyote meals. The new chicks are 4 weeks old as of Monday. They are nearly fully feathered and really beautiful! The transformation is always amazing. Since I’m trying two new breeds this year I’ve been trying to pictorially document their change into adult plumage. Not an easy task as they move around like bullets, trying out their wings and exploring. Yesterday I got them outside in their permanent “teenage” area instead of in the smaller cage I’ve been using and moving around on the grass up near the house. They are still too small (not fully feathered so unable to fully regulate their temperature) to stay out overnight or in cold, wet weather so they move back and forth to their cage in the basement in a cat carrier. They are amazingly smart. They learned to go into the carrier when I go out late in the day, all crowding in so I can take them inside. It only took them a few days to figure this out! It is their natural inclination to seek shelter when it starts to get dark which I’m sure helps, but often I’m moving them well before dusk due to the cool temperature or rainy weather. 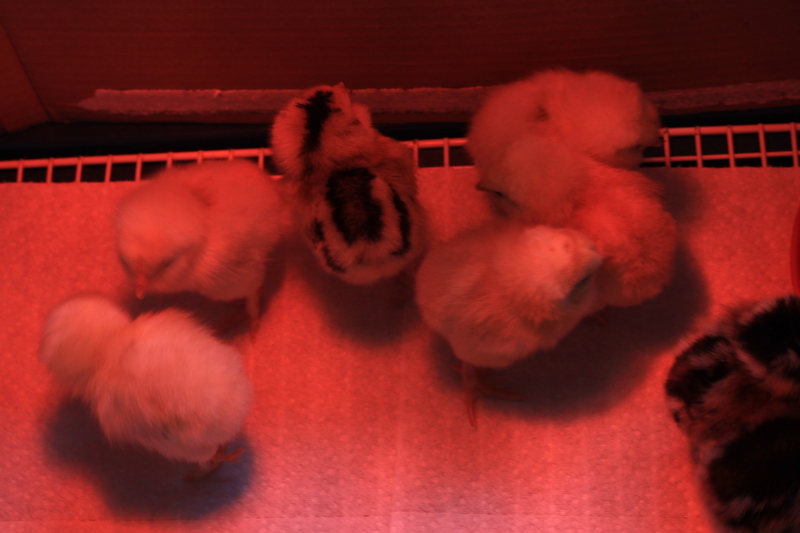 Chicks feather out more quickly when the temperature is low versus when they are raised in warmer ambient temperatures. They have a light in their cage that allows them to warm up if they get cold, but the basement ambient temperature is about 60-65 degrees. That’s why they are almost fully feathered at 4 weeks instead of the more typical 6 weeks. The difference in their personalities is obvious even at a very young age. The Salmon Favorelles are much calmer and peaceful than the Chanteclers which are calmer than the Ameraucanas in general. 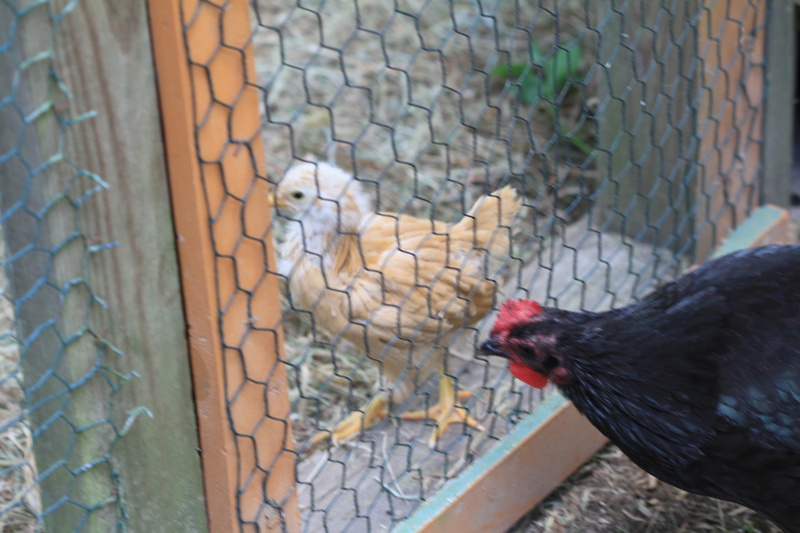 There is one Chantecler that gets upset about being handled as well as two of the Ameraucana chicks. They are all getting better with the twice daily routine of being lifted in and out of their cage and being taken outside. Nothing like a little treat of white bread once they are out to make it an overall positive experience! I also try to pick them up slowly and respectfully, trying to get them to come to me so I can pick them up versus grabbing at them. Above is a group picture at 3 weeks of age showing a Salmon Favorelle in the front, Ameraucanas on each side and a Chantecler in the far back. 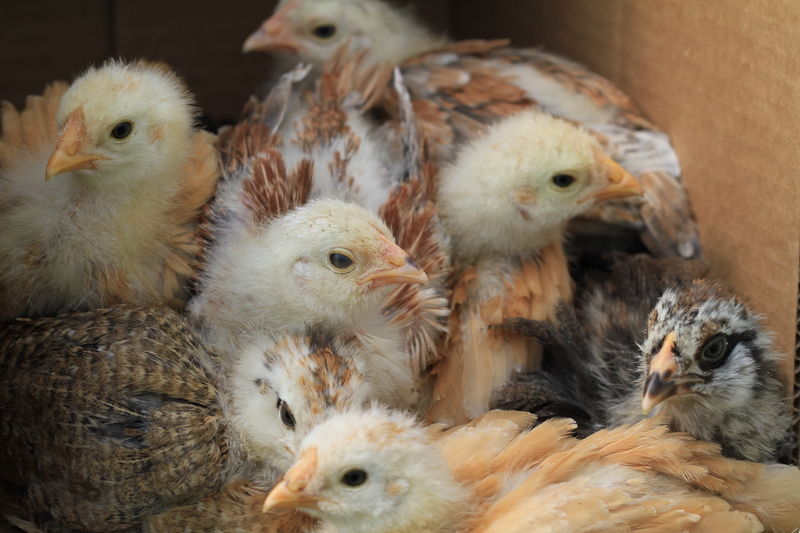 They love to crowd into a box and peck at the box sides which makes an interesting noise (to a chicken!) . 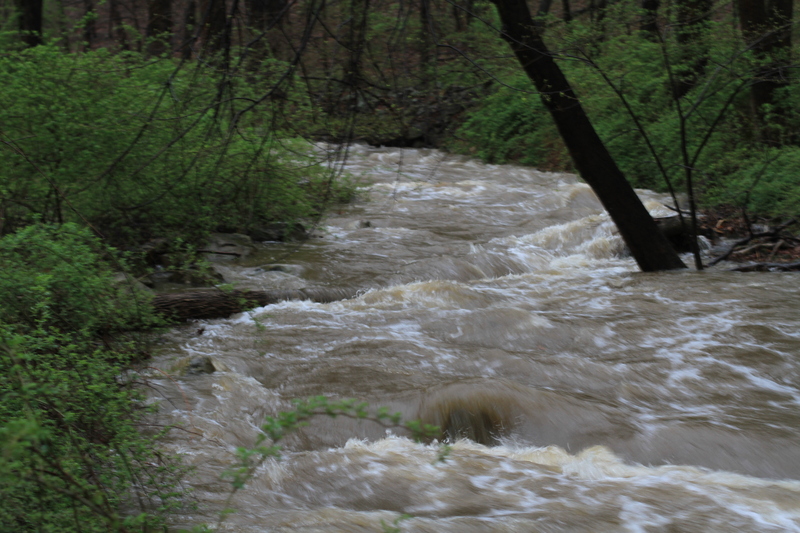 30 something degrees and 6 inches of rain the last Wed. in April! However, nothing like the 22 inches of rain in FL nor the tornadoes in the South so no complaints here. 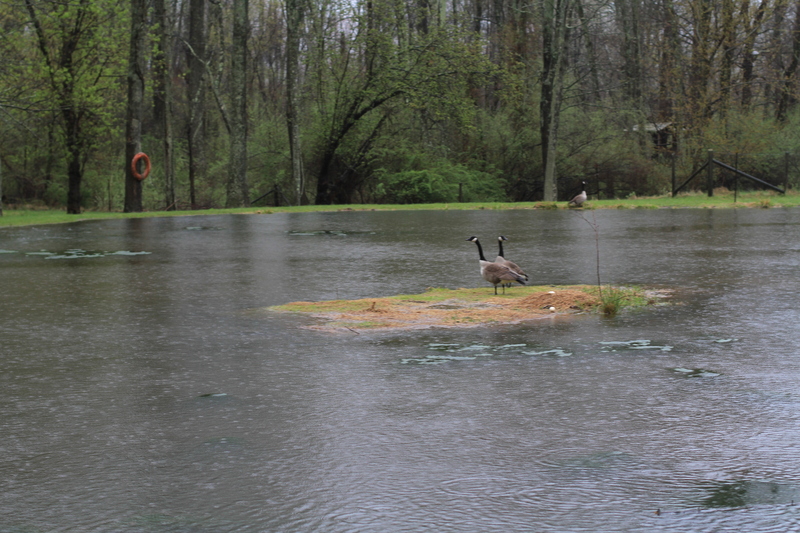 The poor geese were watching their island nearly disappear as the pond could not discharge water fast enough to stay within it’s banks. 6 goslings had hatched out just earlier in the week, all survived the flood but one seems to be missing this week. Bad week for adult chickens. Chocolate (an Ameraucana hen) was found dead one morning under the perches. A necropsy revealed internal tumors and 4 fully formed eggs without shells in her intestinal cavity! Several days later at dusk, Placido (the lone rooster, also an Ameraucana) was found face down in the drainage ditch near the hen house. He had been seen walking the territory and crowing very shortly before he was found dead. Had seemed in good health, was a good weight and had not a mark on him. Best guess is that he had a heart attack or an aneurysm to go so suddenly. It’s much quieter on the Farm without his cheerful crowing. On the positive side, this year’s chicks arrived in good health! I’m trying some new varieties this year, Chanteclers and Salmon Faverolles. Both were bred to lay well in the winter, and are very cold hardy. The Chantecler was developed in Canada and the Favorelle has 4 toes (vs the “normal” three) and their toes are more flattened (vs completely round) with some feathers but not completely feathered. I’m trying to get pictures of their legs but it’s not easy as they are not too fond of posing for the camera while held in the air (easiest way to see the legs clearly). Both are rare breeds. The Chantecler is listed on the Livestock Conservancy Conservation Priority Poultry Breeds 2014 Critical list and the Faverolle is listed on the Threatened list. They join the Dominiques ((Watch) and Delawares (Threatened) that I’ve raised for over 15 years. I always have Ameraucanas too as many of my customers love the green eggs they lay. Last year I added 3 Australorp hens as they are great egg layers. One was a runt (although she is doing well, just tiny) and another, sadly, has developed a neck twitch which means she won’t last long. They are friendly and productive but have big combs which make them susceptible to frostbite. I’ll post notes comparing the breeds as they get older. I’ve finished another Inkle and like the pattern so much I think I’ll do another using some of my dyed yarn. 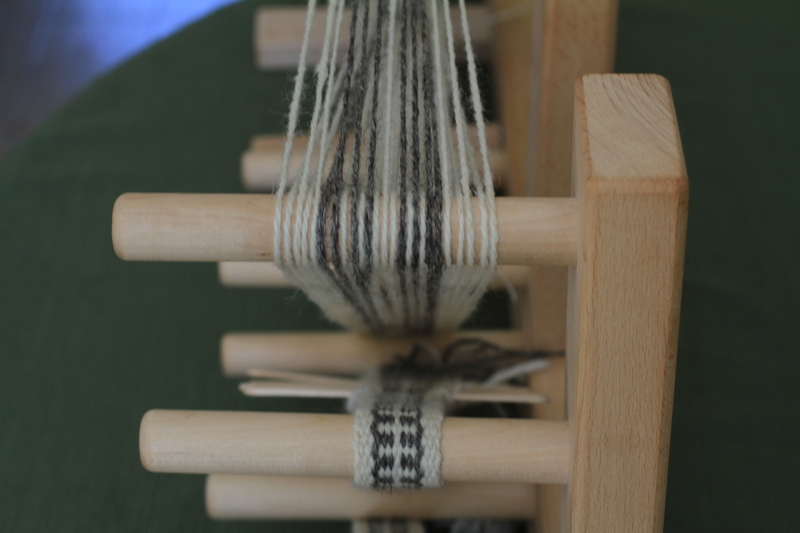 The picture above shows the warping pattern as well as the pattern as it is woven, and the finished Inkle is shown below. 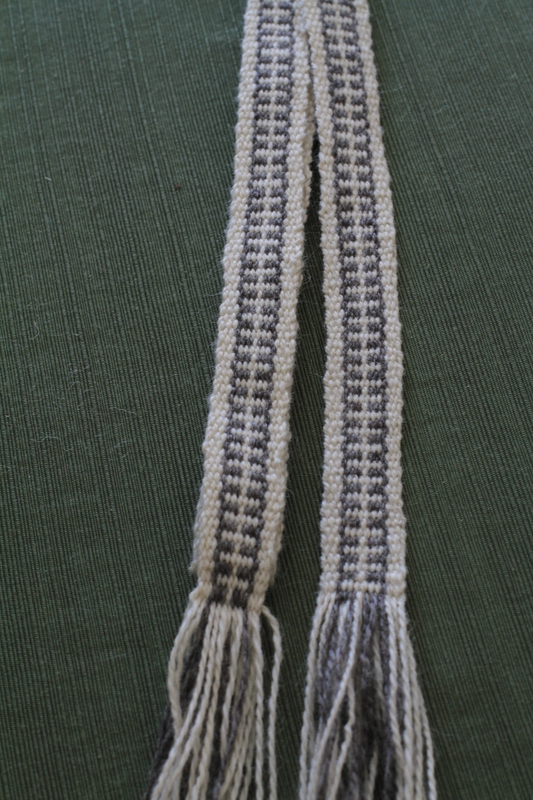 I really love weaving Inkles as they provide a great sense of accomplishment very quickly! I’ve been putting off starting on a set of tapestries I have designed and warped since I know it will take a long time to compete them. It’s time to start washing fleeces since the Spring shearing was successfully done in between major rain storms!